While I’m busy with some stuff (including my wedding anniversary! ), I’m going to fire some sketches your way. This time, it’s an alternate take on my Zur the Enchanter card from MTG: Coldsnap. The sketch cycle for Zur was one of the lengthier ones of my Magic career, probably only beaten by the crazy amount of drawings I did for the 8th edition version of the Lhurgoyf. Yeah, he’s one grumpy enchanter ready to ruin your day. So, for my next sketch, would you like something else from Magic, or something completely different? Magic is almost all I know you from. I’d like to see something else you’ve done! FYI, I’m not taking requests. I’m just asking what kind of thing people want to see next. I have a batch of sketches scanned. 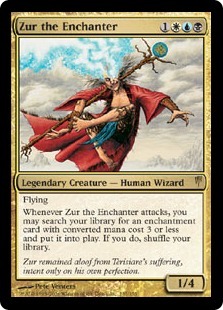 I always liked Zur, but found it a shame that he didn’t had as much time in the spotlight:(. 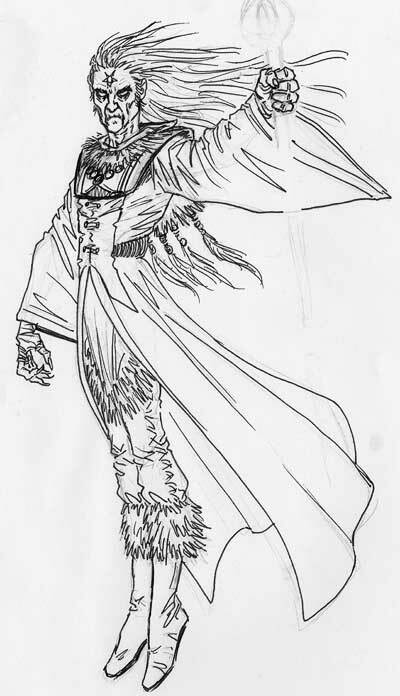 Also, what was your motiviation from going to a stern, clothes wearing wizard to a insane, naked except for a coat wizard?. I like the angry Zur much more than original. And answering your question, I prefer Magic ilustrations but, what about a V:TM skecth? Hmm, in that case, I’m going along with gregtork. I’d like to see a V:TM picture too.